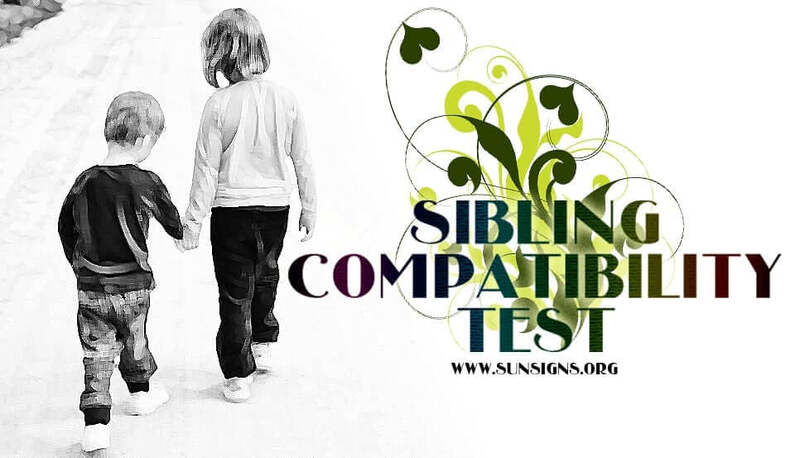 The Sibling Compatibility Test will help you to understand your brothers and sisters better in the coming years. Know the different ways in which you are well-matched and where there may be conflict. Being aware of the areas of conflict can help you to understand why an argument may occur between siblings and help you remedy the situation. In life often one of your dearest friends is a sibling and their connection with you is difficult to break. This online astrology Sibling Compatibility Test is free, it is accurate and the report is simple to understand. When we have brothers and sisters we definitely form relationships with them. Sometimes these relationships are very good and very happy and other times they are strained. The more we know about the compatibility between our siblings and ourselves, the better we do together. Sometimes we just plain do not fully understand why we have the relationship we do with our siblings. Sometimes you have a big brother who is the bully, or sometimes you are the one who bullies your big brother. It can be helpful to know more about how the different zodiac signs react to each other and to various situations and things that happen in life. A sibling compatibility test can aid in your understanding of your siblings and can help you to share a much fuller and more beneficial relationship. Being a brother or sister is very special. No one else will ever have quite the same relationship with you as those tied to you by blood. The better you and your siblings understand each other the greater the joy you will finding in each other and the more support you will be able to provide each other. Siblings will often argue about the silliest things. You might be talking about growing up together or playing hide and seek. You might also end up fighting about who was it when one of you fell out of the tree where you were hiding. These arguments are petty and you can usher in a new and better relationship by learning the ways in which you and your siblings are compatible or incompatible. Maintaining the family circle is an important thing. Maintaining these relationships may take some work but it is this effort that is of value in the long run. It is helpful when you have family to provide support and siblings to turn to in a time of need. When the family relationship is maintained well then you need never fear being without someone to care. Try this sibling compatibility calculator and get to know your brother or sister better!